In this article we’ll recap on the basics of overtaking, then talk about advanced techniques taught to police drivers and instructors. 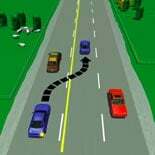 The Road Code has an excellent basic set of guidelines for overtaking. Overtaking is the most risky manoeuvre on the roads because you expose yourself to traffic travelling in the opposite direction, and often higher speeds are involved. Overtaking requires that you make many more judgments about speed, obstacles and risks than regular motoring. When you pass on the right you can put your vehicle in danger because you might have to enter a lane or part of the road that’s used by oncoming vehicles, you could have to accelerate briskly, you’re changing your path of travel and there’s a risk that the person you are overtaking hasn’t seen you. You should only pass if it’s necessary to pass. For example, if you are following someone on the open road doing 95kph, is it really necessary to urgently pass just to do 100kph? Impatience with the vehicle you’re following can cause you to make rash decisions and put yourself in danger. Passing is relatively straightforward if you follow the rules. First, you need to prepare to overtake. This means getting your vehicle in a position where the vehicle you are about to overtake, and any vehicles following you, know what your intentions are. This helps prevent a vehicle behind you beginning an overtaking manoeuvre when you are about to pull out to overtake. Then you need to judge distances. You need to be able to see 100m of clear road ahead of you once you have finished overtaking, so you will need to judge your potential acceleration vs the speed of the vehicle you’re overtaking. Then you need to read the road ahead and identify dangers. All kinds of dangers exist such as dips, crests, driveways and so on. Check your mirrors to ensure no one else is passing you. If you’re sure it’s safe to go signal (for 3 seconds) and make your move. Be ready to abort if you assess the situation isn’t safe. Signal left and pull back into your lane when you can see the vehicle you are overtaking in your rear view mirror. You should have already made sure your rear view mirror is set so that you can see clearly out of your rear window. If you’re overtaking a cyclist, motorbiker or horse, leave extra room. If a road has three lanes with two lanes travelling in the opposite direction, you can overtake if the white line closest to you is broken and there is no traffic coming towards you in the middle lane. 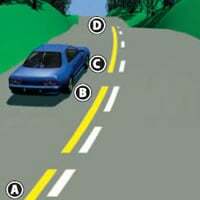 If you have a solid yellow or white line, you must not overtake. You are only allowed to pass on the left when there are two or more lanes on your side of the centre line and the vehicle in the right hand lane is going slower than you, and it is safe to do so (like in the image below); or when a police officer directs you to, or when a vehicle has stopped or slowed down and is signalling a right turn or is making a right turn. The yellow line is a road marking that you must not cross unless directed to do so by police, or you are turning into a driveway. The yellow line is called a no-passing line and it’s usually there because it’s unsafe to cross the centre line. There might be a hidden dip or crest, or a corner that you can’t see through. Or, it might have been an accident blackspot in the past and it is safer to not overtake there. Passing lanes are also marked on three-lane roads so that traffic travelling in the direction with two lanes is not permitted to use the third lane. No-passing lines are warned in advanced with a broken yellow line which you can see starts a A. The line begins at C. You must not start to pass on a broken or dashed yellow line, but you can move back into your lane if you are already overtaking. The only time you can overtake when there is a yellow no-passing line is if the lane is wide enough for two vehicles, you can see 100m of clear road in front of you for the whole time you are passing, and you stay on your side of the yellow line. Before passing, ask yourself is it necessary. Don’t be afraid to hang back and wait, especially if you’re feeling impatient as this is often when you make poor judgment and have an accident. Before you pass you need to make sure that you can complete your manoeuvre and still see 100 metres of clear road ahead of you. Look as far ahead as possible, check your mirrors, signal for at least three seconds and move out to pass. (Interestingly, the Road Code does not mention that you should check your blind spots, but you should). Before pulling back in front of the vehicle you’ve just passed, signal for at least three seconds and check you can see it in your rear view mirror. If you are passing a horse, speed can cause the horse to panic. Give it a wide berth and slow down to overtake. Don’t use your horn. This is the question in the Road Code regarding passing a horse. If you are passing cyclists, especially children on bikes, give them a lot of room as gusts of wind can blow them into your path, and your slipstream can also affect them. Stay a safe distance behind the vehicle you’re about to pass, and if you are being passed yourself, move left to give yourself a buffer, and don’t speed up. If there’s a solid yellow line on your side of the road, you must not cross it to overtake. If there’s a dashed yellow line it indicates you are coming up on a solid yellow line. You can pass where there’s a solid yellow line only if the road is wide enough for two vehicles, you don’t cross the line and you can see 100m of clear road ahead for the whole time you are passing. You can use an oncoming passing lane if there is no traffic in the lane. You can get additional passing theory from your driving instructor. The following is advice provided to police drivers and members of the Institute of Advanced Motorists. Overtaking should be seen as a set of hazards that you have to deal with. The main hazard is the vehicle you’re overtaking, then there are many minor hazards such as the road surface, the weather, vehicles on the side of the road, pedestrians, animals, and so on. These hazards could be difficult to predict, particularly things like a dog running out in front of you, or the vehicle in front hitting a puddle which causes spray that temporarily affects your view of the road. The overtaking position is a compromise between staying back a safe distance (two or more seconds), and reducing the time it takes to get past the vehicle in front. There’s no specific guidelines about how close you should be to the vehicle in front, except that you should be aware that it is more dangerous because your vision is reduced and if it brakes or stops suddenly you may run into the back of it (read our article on tailgating for the reasons why). Following another driver closely for too long might cause them to speed up (which will make it more difficult for you to pass), or become angry at your driving, which could lead to a road rage incident. 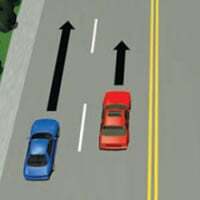 The overtaking position lets both drivers following you and the driver in the vehicle ahead of you know that you are preparing to overtake. If you are following a large vehicle such as a truck, a car towing a caravan, or agricultural machinery such as a combine harvester then if you are too close you might be hidden from the driver’s view. Make sure you can see their mirrors so that they can see you. In the overtaking position you will also be closer to the centre line. Be careful of oncoming traffic, particularly large, wide vehicles, or where the road is narrow or there are other hazards like parked cars on the other side of the road that would mean that oncoming traffic will be closer to the centre line. If you can see ahead that you can’t overtake for some time, drop back again to maintain a safe distance. When you have completed your overtaking manoeuvre you need to be able to pull back to the left, but have you got enough room? Knowing the performance of your car, bike or truck is essential for being able to judge whether you have enough room to complete the manoeuvre. If you are overtaking a line of traffic, this is more dangerous as the obstacle is longer and other drivers in the line may pull out to overtake without seeing you. Look for other vehicles beginning to drift towards the centre line even before you see an indicator signal to give you a clue as to a driver’s intention, especially if you can see where they are looking and that they have also moved up into an overtaking position. They may be less confident than you, and have therefore waited slightly longer to begin the manoeuvre. This also applies to you: before you make your move, check your mirrors and over your shoulder to ensure another driver hasn’t pulled out to pass you. This is less likely to happen if you are clearly signalling your intent, and indicating before you intend to move, but you cannot take it for granted that it won’t. Look as far ahead on the road as you can. Are there any side streets, farm gates, driveways or other places vehicles could turn into the road. If there’s a right hand turn ahead and you are overtaking a line of traffic, this will be extremely dangerous if one of the vehicles turns right as you are overtaking. It also puts you at risk of a driver turning into your path from a side street without looking. Pay attention to clues that indicate where the road goes beyond where you can see – the tree line, vehicle lights, lamp posts, etc. New Zealand has a large network of rural roads without streetlights. However, there is often a light at junctions. Look ahead of the vehicle or vehicles you want to overtake and make sure there is a gap you can pull into. If one vehicle is tailgating another then there might not be the gap to pull in if you need to, or it might be that they are ready to overtake. You’ve checked the mirrors, signalled and done a final check over your shoulder. Now you can pull into the right lane. You will have a better view of what’s ahead. If you have any doubts about whether to complete the move, it’s best to pull back into your lane: it’s better that you abort the passing attempt than cause a head on collision as the risks of it causing a serious, debilitating injury (if not a fatality) are close to 100% at highway speeds. If you are overtaking a line of traffic you need to consider it as a number of smaller overtaking moves that might end up being joined together. At each point where you can pull back into the line of traffic evaluate whether you can continue or whether you should rejoin the line. Traffic enforcement agencies must set laws such as speed limits, and unfortunately these can’t be flexible otherwise they get abused. Technically, it’s safest to complete your overtaking move as quickly as possible staying within the limits of your vehicle and your driving ability. However, the law states that you should remain within the speed limit when overtaking, even though this increases your time exposed to danger. Automated speed cameras will not be lenient if you are driving beyond the speed limit while overtaking. Police officers may or may not be lenient depending on the circumstances. Non-emergency services drivers should overtake only when it’s safe to overtake by staying within the speed limit.